Welcome to the BFM Restore & Rebuild Barbuda Mission page, I am so glad you’re here! Your interest in our mission to help restore lives and rebuild homes on Barbuda is an answer to our prayers. After Irma, a 5++++ hurricane decimated our beloved island; BFM has become even more devoted to the people of Barbuda. We are now working along with Samaritan's Purse (SP) and the Red Cross (RC) to complete the rebuilding of homes that were destroyed. SP is putting on the roofs and the RC is providing funds to help with the exterior doors and windows. This is where BFM comes in, our Restore & Rebuild Teams will come in after doors and windows are installed and aide in all aspects of interior finish. This includes, but not limited to, interior carpentry, electrical, plumbing, tile work, interior doors, painting and of course a little décor design! The more teams we have the more families we can help. BFM is a tiny ministry compared to SP and the RC, but we believe we can make a mighty difference one family home at a time. 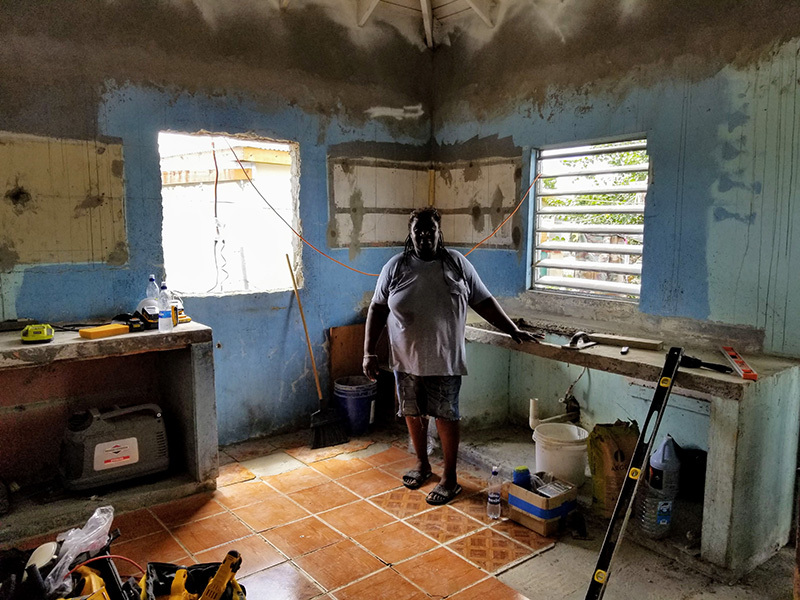 Because of the Lord's help and the support of churches and individuals, we are making a small but significant change in the lives of the people of Barbuda, who have come to own our heart. 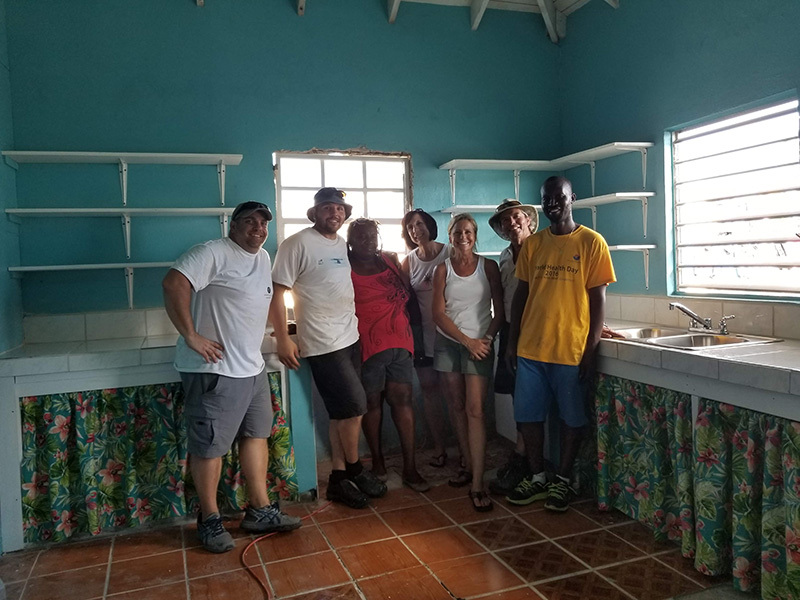 On every upcoming trip each BFM Restore & Rebuild Mission Team Member will be given a choice to be involved in construction and restoration projects and/or with our Christian mission, to minister to the youth, to the Barbuda Sisterhood and all people of Barbuda. Whether you are here to sign-up for a trip, or to donate towards the funds needed to cover the material costs for each home, we are extremely grateful! I encourage you to watch the videos posted here, they beautifully describe previous trip accomplishments and share the family stories of our future recipients. May God richly bless you for your support! Ruth Harris, her legally blind husband Oakland, two children and 12 grandchildren who are all living in tents and the shell of what was once her home. Ruth was the first woman to return to Barbuda just 25 days after the hurricane. She lived there alone with her kitty, sharing what little food she could gather. Slowly this determined woman managed to accumulate what she needed to survive and now a year later Ruth has her family back, but her home is barely livable. With no kitchen they cook outside on make-shift grill made of a wire rack placed over a tire rim. When Ruth was told she was our next recipient, she cried tears of joy and with a grateful heart danced around rejoicing!